HomePod is the best sounding smart speaker but ‘at the bottom of the totem pole in terms of AI assistant performance’, according to an in depth test performed by Loup Ventures. Yesterday, we put HomePod through the smart speaker gauntlet which included 782 queries along with comprehensive tests of sound quality and ease of use. Our methodology was comprised of 3 HomePods being tested throughout the day by the Loup Ventures team. ● HomePod is hands down the best sounding smart speaker. 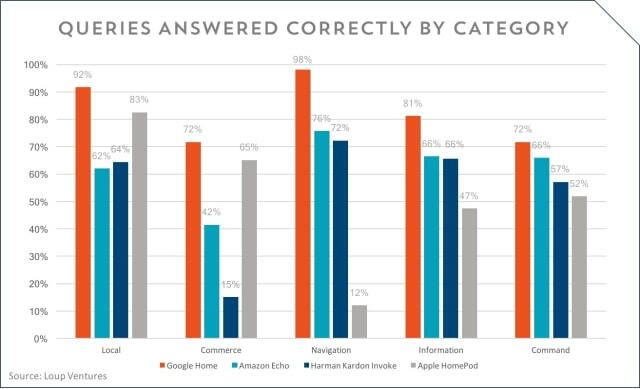 ● As a smart speaker, it answered 52.3% of queries correctly compared to recent tests of Google Home at 81%, Alexa at 64%, and Cortana at 57%. ● The user experience of HomePod is measurably better than its competition (setup, communication style, listening ability). ● HomePod has superior listening skills to other smart speakers. This is partly due to a noise cancellation feature which allows you, even at a volume where you would have to raise your voice to talk to others in the same room, to use your regular speaking voice with Siri. This was HomePod’s most stellar feature. ● Wireless setup was super easy. In fact, it was the easiest of any of digital assistant we have used (Alexa, Google Home, Cortana, etc.). You already have a companion app and don’t need to wrestle with wifi networks. ● Siri’s voice sounds smoother and more human than it does on your iPhone. ● Her communication is also more human-like. Specifically, after asking a question, she does not repeat the whole thing back to you as is the case with Google Assistant and Alexa, which makes for a subtly smoother process. ● The tap UI on the touch-sensitive display requires a small amount of instruction, as it is not immediately obvious that you tap to play.pause, double tap for next track, triple tap for previous track, and touch and hold to bring up Siri. ● HomePod’s packaging is a new level of perfection for Apple. The perfectly fitted box requires you to open it at “reveal” pace, and even the external plastic wrap is pleasing to remove. ● As a speaker, it sounds incredible – mission accomplished. As a digital assistant, whether it is a direct competitor or not, it is better than what we expected for version 1, but still lags behind Alexa and Google Home. Loup notes that Siri has the ability to answer a whole range of questions that the HomePod cannot. Additionally, the HomePod doesn’t currently support a variety of functions including navigation, calendar, email, and calling. These are things that Apple can add in a software update. When they arrive, the HomePod will become more useful. Once the HomePod reaches the same AI performance as its competitors, customers will need to decide whether its worth paying 4X the price of an Echo for a better sound experience. Loup Ventures predicts HomePod unit sales of 7 million in 2018 with a $349 ASP, which adds approximately 1% to revenue and earnings. In CY19, they expect unit sales of 10.9 million and see growth of 40% and 45% per year over the next 3 years.